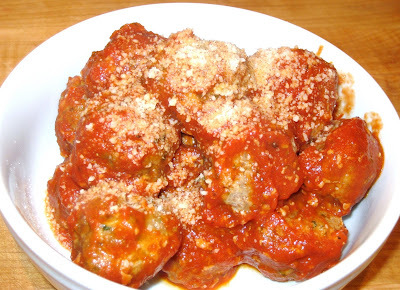 I know, I know, you are probably thinking why would you need another meatball recipe. I'll tell you why. These meatballs are incredibly flavorful, super fast to prepare, perfectly seasoned, and after all......they're Nana's! Well, not exactly my Nana's, but someone has a Nana at Bon Appetit. That's where this recipe came from and I have been making this recipe for over 20 years. And when I say fast, I can have 26 perfectly shaped balls in the oven within 15 minutes. I think that makes it an easy qualifier to enter the weekday meal category. I must tell you that I have another meatball recipe to die for but it's very involved and a full commitment on a rainy day. After having this recipe, I'm not so sure I would bother with the other one. I hope you try these, let me know what you think! 1. Spray a 9x13" glass baking dish. 2. Mix together the first 6 ingredients. Season with salt and pepper. 3. Using a melon scooper, form meatballs into 1.5" diameter balls, or use your hands, and place in a baking dish. 4. Bake for 30 minutes, until cooked through. 5. Meanwhile, heat sauce in heavy saucepan. Add meatballs and toss to coat. Serve alone or over pasta. Using the combination of pork, veal, beef creates a soft, mild, perfectly flavored savory meatballs. Tip: Fresh breadcrumbs keeps meatballs soft and moist. I make my own by taking all the ends that accumulate from a loaf of bread and grind them in the food processor. They keep for months in the freezer in an airtight container. I have always had a passion for cooking ever since I was a child. I love reading recipes and collecting cookbooks and recreating dishes with my own twist. I am always on the hunt to discover my next favorite recipe and I invite you to try mine and hope you find your next favorite recipe! Cauliflower Crust Pizza.....you won't believe it! Maple Syrup Salmon, it's a keeper!